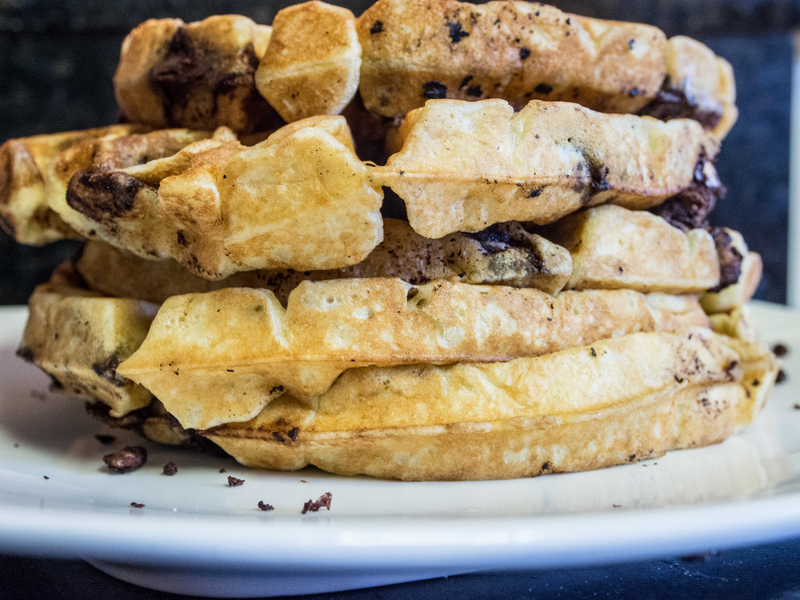 Waffles are a really, really old food. So old, that there is reference to them in Chaucer’s The Canterbury Tales the 14th Century! Puritans, fleeing English persecution, stayed for a bit in Belgium and brought the waffle to colonies. Thomas Jefferson, according to legend, brought a waffle maker from France and threw lavish waffle parties. Who doesn’t love a good waffle? I really, really love waffles. When I was a kid (and there were only 3 channels on the tv), all we had were pancakes. Waffles were restaurant type food. Fancy stuff, not something mom would just make for breakfast. Even though pancakes are made with essentially the same batter, the batter was transformed into something special on the waffle iron. Crunchy, yet tender. Somehow always sweeter. Enriched flour (wheat flour, niacin, reduced iron, vitamin B1 [thiamin mononitrate], vitamin B2 [riboflavin], folic acid), water, vegetable oil (soybean, palm, and/or canola oil), eggs, leavening (baking soda, sodium aluminum phosphate, monocalcium phosphate), contains 2% or less of sugar, salt, whey, soy lecithin, yellow 5, yellow 6. Water, Organic Whole Wheat Flour, Organic Unbleached Wheat Flour, Organic Soybean Oil, Organic Oat Fiber, Organic Cane Sugar, Baking Powder (Baking Soda, Sodium Acid Pyrophosphate, Monocalcium Phosphate), Organic Cornstarch, Organic Malt Extract, Sea Salt, Organic Soy Lecithin, Organic Guar Gum, Organic Caramel Color. I’m not sure how I acquired my first waffle iron. I just remember buying a box of frozen waffles and thinking how EXPENSIVE they were. And I had to buy 2 boxes for just the weekdays. I decided to buy a waffle iron and try it out. It was so easy! My kids pretty much eat waffles every day for breakfast. I make them on the weekend, freeze them, and toast them all week. It’s really not that hard and makes my mornings SO easy. I make eggs or reheat sausage made the night before and toast the waffle. Viola! Breakfast. Of course, my kids now think pancakes are a special treat! The ingredients I use are organic or pastured and I don’t need guar gum and colors to make them look good. And, the fat in the recipe is butter versus soybean/vegetable oil. Needless to say, they are a lot cheaper! Waffles require a gentle touch. The key is bubble maintenance. 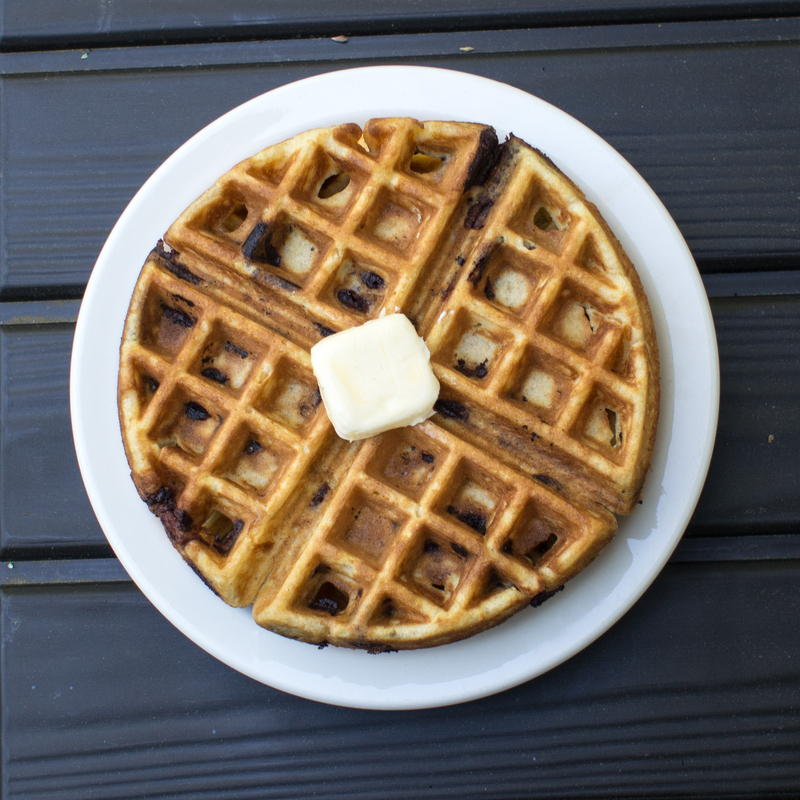 A good waffle recipe has two methods to infuse bubbles into the batter. One is through chemistry. The combination of an acid and a base (usually baking powder, which is activated by liquid). The other is through the whipping of the egg whites. I will confess that I have skipped the egg white whipping portion of the recipe and just tossed the eggs in there and really, saw no appreciable difference. I’m serving a 7 and a 10 year old. Not Gordon Ramsey. So, when you get to that part of the recipe, understand that you can take a short cut. Also, I have substituted Whole White Wheat flour from King Arthur Flour for the All Purpose Flour and no one seemed to notice. In a large bowl, combine flour, baking powder, salt and sugar. Whisk until aerated and well combined. In a separate bowl, whisk together milk, butter and vanilla. Slowly add the wet mixture to the flour mixture and stir just until the flour mixture is moistened. In a mixing bowl, beat egg whites until they hold firm peaks. Fold the egg whites into the now moistened flour mixture until just combined. Gently fold in the chocolate chips. Spray the waffle iron with a spray oil (I use coconut) and then follow your waffle iron’s instructions. I freeze the leftovers in a freezer bag and enjoy the rest of the week. 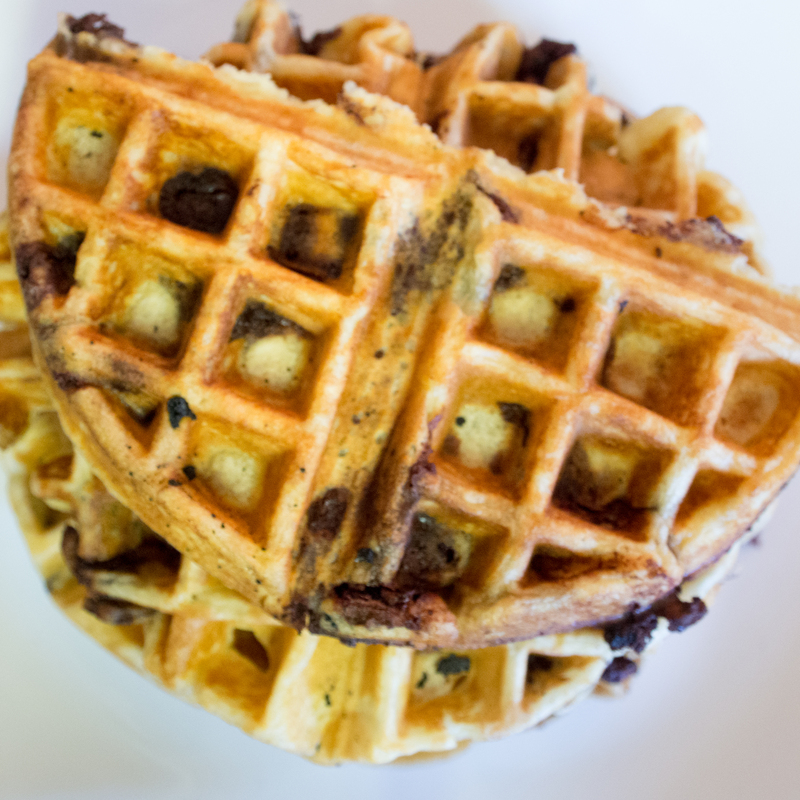 This entry was posted in Breads, Breakfast and tagged Baking Powder, Breakfast, Chocolate, Chocolate Chip Waffles, Eggo, King Arthur Flour, Quick, Waffle on April 11, 2013 by dawn of food. beef fat, flavoring, hydrolyzed wheat gluten, dextrose are ingredients containing hidden MSG. large bowl covered with 3-4 inches of cold water.